Can you spot Ms. Barred Owl? The guest of honor didn’t have much to say, but that didn’t bother any of the Friends of Gulf Branch Nature Center who came out on the evening of March 10 to celebrate ”Mr.” Owl and the handsome house the barred owl occupies on the center’s upper terrace. The ecologically friendly wood-and-mesh Owl House, built with private donations, hugs a gentle slope and is just the right size for a growing juvenile Strix varia. Dozens of GBNC enthusiasts visited with the newcomer, who came to the nature center following the unexpected demise of Gulf Branch’s previous resident barred owl last year. Mr. Owl, it turned out, was honored under somewhat false pretenses. Within days of the party, the results of a gender-determining DNA test arrived at Gulf Branch. They showed that Mr. was actually a “Ms.,” and probably a bit on the small side for her gender. Barred owl females typically are larger than males; otherwise, the species displays no external visual clues to differentiate the sexes. While partygoers enjoyed cake and hot apple cider on the seasonally cool late-winter evening, Ms. Owl ignored her festive fare – an assortment of tasty mice placed on her feeding shelf. She apparently was too busy people-watching and listening to the amazing owl facts provided by ARMN volunteer Phil George at a demonstration table in front of her house. Inside the center, visitors could virtually dissect the contents of an owl pellet–the regurgitated bullet of fur and other critter parts that owls cough up after a meal–on a computer screen, thanks to a very user-friendly program available for free at www.kidwings.com/owlpellets. Upstairs, little kids made owl masks and did a habitat activity. Ms. Owl has an interesting backstory. Found in a Purcellville yard not long after she had fledged early last year, she seemed unharmed but couldn’t extend one wing fully, and so was taken into rehab. Even after extensive TLC, she remained flight-challenged and couldn’t hunt. It was soon clear that the young owl would need to be accommodated somewhere for the rest of her life. Ms. Owl has adjusted well to life at Gulf Branch. She has been heard clicking her beak, but has never vocalized, at least not within earshot of staff or visitors. She has limited flight, managing to flap down to her feeding shelf and then back up to the roosting box. She has yet to have her portrait taken, but Gulf Branch naturalist Jennifer Soles says she is ready for her close-up and the staff will try to photograph her at a time when conditions are good for a flash-free shot. In the meantime, Ms. Owl continues to meet the public–no dogs, please­­–in her safe and attractive outdoor abode. 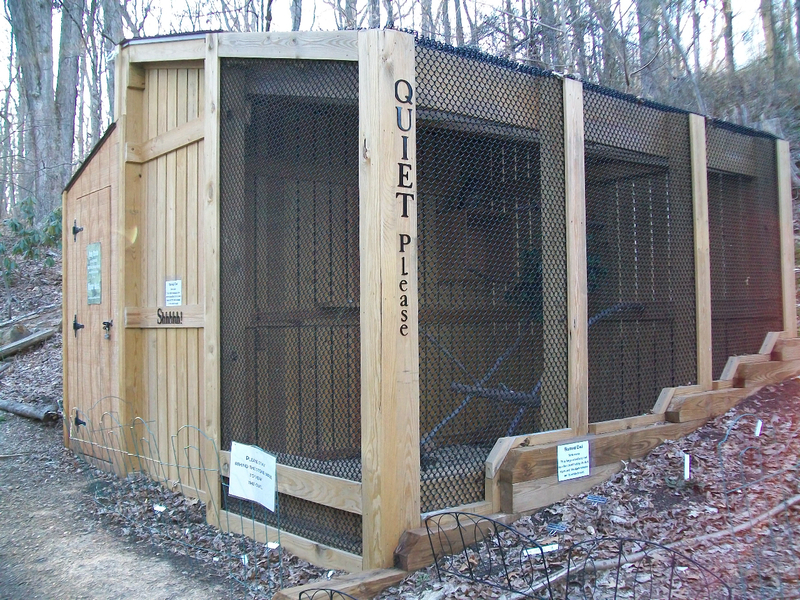 This entry was posted in News and tagged education, gulf branch nature center, owl by armneditor. Bookmark the permalink.